“The Tao that can be told is not the eternal Tao” so begins the Tao te Ching; “The Book of the Way,” by Lao Tsu. Over 25 years ago I consciously began my journey on the Path. One of the first books I stumbled upon was Stephen Mitchell’s translation of the Tao. I keep a copy with me and drag it out every once in while. Sometimes I get in a mood where I take my pocket copy with me everywhere, though I may never look at it when I do. The message is pretty simple: Don’t try to control the universe. Be in the moment, let life guide you, and become a master by not trying. Of course there’s more to it than this. I refer you to the first sentence in this post. I’m sure the Old Boy knew the irony of making that the first line of his book. In the passing years I’ve learned many things, and unlearned many as well. I have to keep unlearning them. 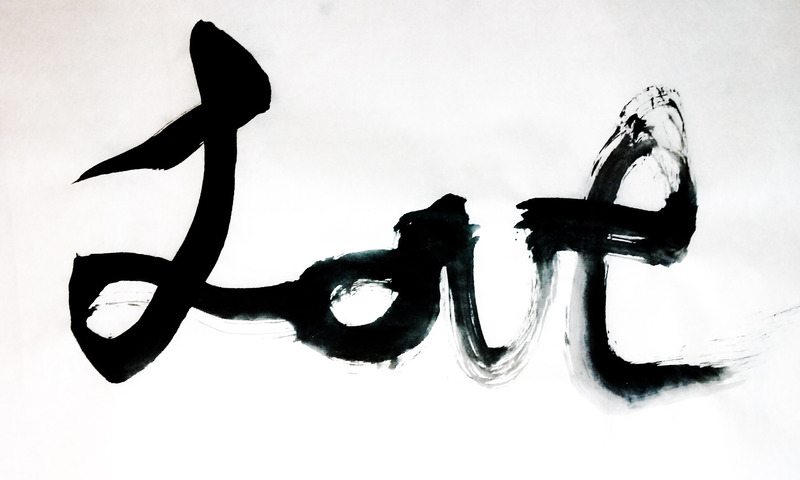 One of the things I’ve seen real value in for me is practicing zen calligraphy. The method is very similar to what I’ve just stated; be in the moment, let the universe be in charge and in this way, become a master. 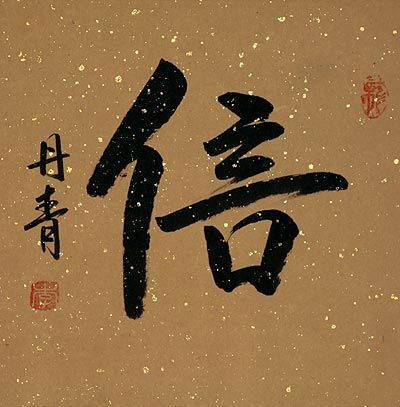 As zen is a Japanese form of Buddhism, the calligraphy is Japanese as well. 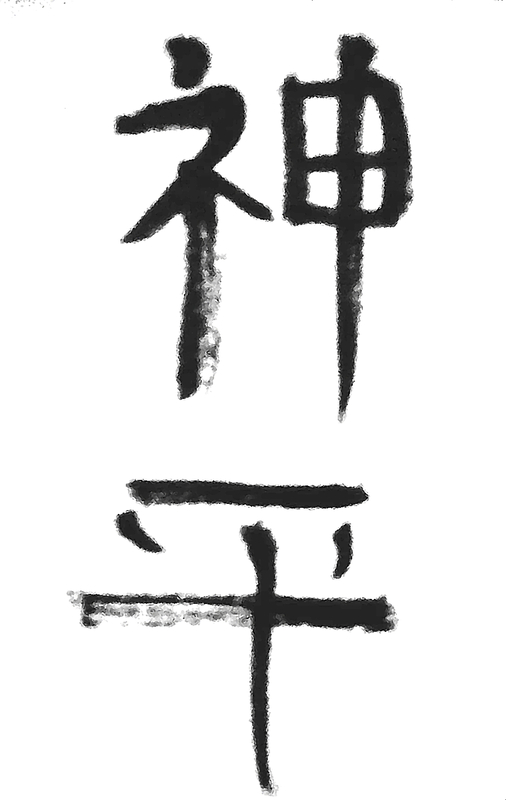 Japanese traditionally write in Kanji, which was originally Chinese, like Taoism. The calligraphic method can be applied to any writing; indeed it can be applied to life itself. 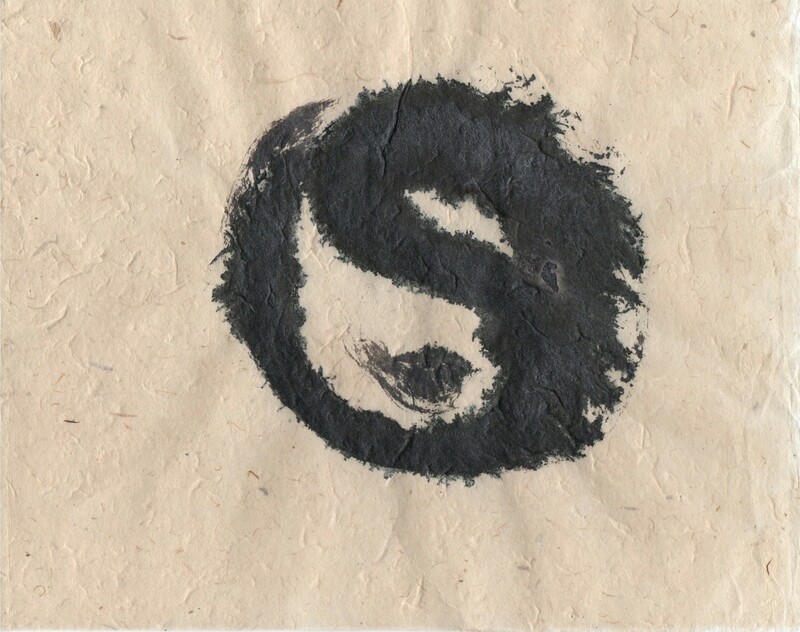 Using the tools to render the Taijitu (yin yang symbol) is a natural. What made me realize this was of course watching Kung Fu Panda III. I was struck by the idea that the image can be seen to describe a spinning effect; as is often depicted with the yin and yang chasing each other. What was significant this time was how it is a symbol for everything. our galaxy is spinning, the sun revolves around it, the earth around the sun as it spins on its own axis. Dervish spin in meditation. Also, in reading up on the symbol, pronounced “Tai Chi tu” by the way, many of the complimentary aspect it represents were explained including one which I hadn’t thought of: the expanding contracting duality of life. This is key to Hamsa meditation, as well as understanding non dualist Kashmiri Shavism, which is another key component of my education. So rendering the Taijitu deeply gratifying to me. It is a powerful exercise and a powerful symbol. Devi is the Goddess of India. Manifesting variously as Kali, Saraswati, Lakshmi & Shakti. Worshipped as the mother of all creation, Devi envelopes us all in her eternal love. 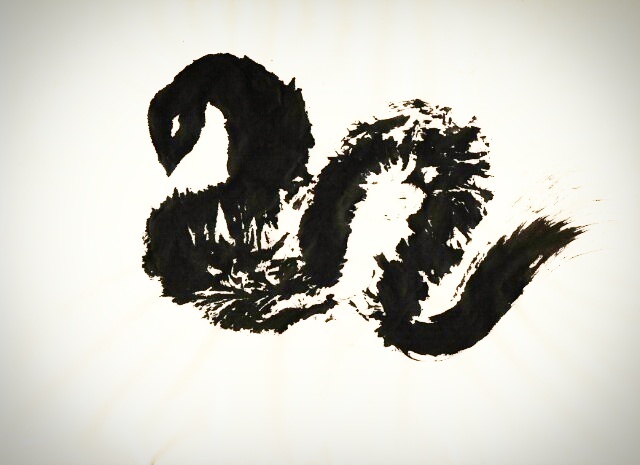 Rendered in the zen style with sumi brush and golden ink on lush paper, hanmade in Nepal from plants indigenous to the Himalayas, this premium product will look stunning in any meditation room, yoga studio, home or office. This item is hand rendered just for you upon ordering, so each one is unique and may differ from the picture shown. 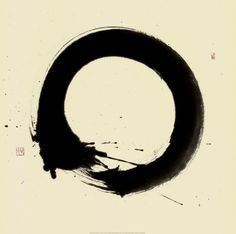 Zen Calligraphy, also known as hitsuzendo, is a style of calligraphy that does not rely on traditional calligraphic aesthetics; instead it is created by the calligrapher, who puts him or herself into a meditative state, and lets the energy he taps into, flow through him and into to the calligraphy. If this is new to you, you may be saying, “what the what?” Let me explain. First, when I say meditative state, I don’t mean like a hypnotic trance. I mean that the calligrapher empties himself (I’m going to use the male pronoun, because I am mainly speaking from my experience, but understand that this is a method that women use as well) of his own thoughts and opens himself to become an instrument, an extension of the brush if you will. In this way, the true Self is the calligrapher and not the ego. As this is a Japanese style of calligraphy, we will use the Japanese term Ki to refer to the energy that the calligrapher channels. This energy can be seen in the powerful and free look to the brush work. 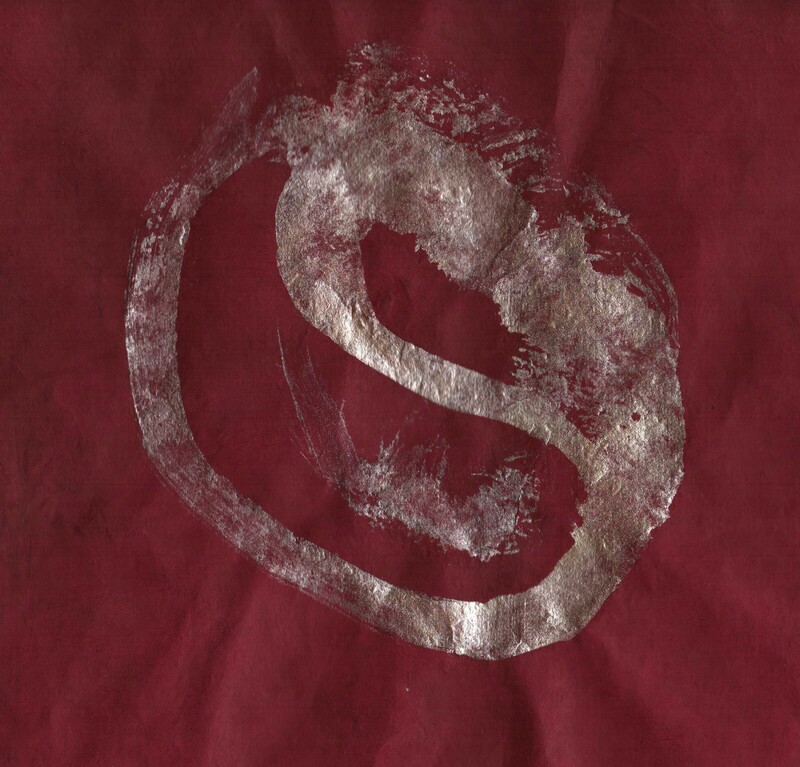 This calligraphy was developed by Zen Buddhist monks and is itself a form of meditation. 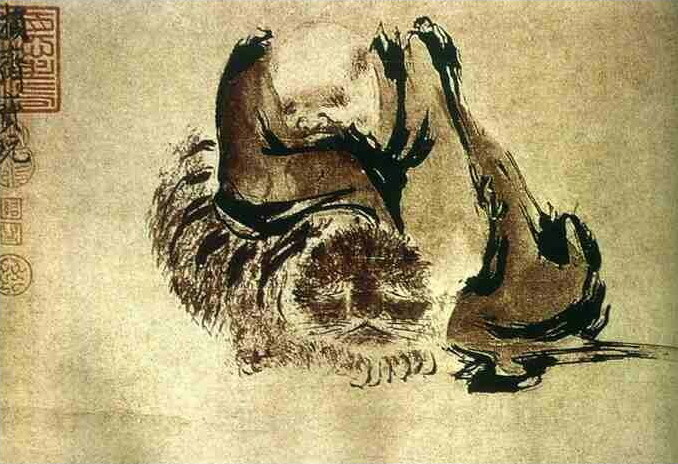 Traditionally, the work consists of a Japanese word or phrase, but can also be a picture or an abstract brush stroke. Once the method is understood, the practitioner is not limited to Japanese calligraphy, but can use the method in any art form. Indeed, Zen masters explain that there is no difference between “shodo” the way of the brush and “kendo” the way of the sword. 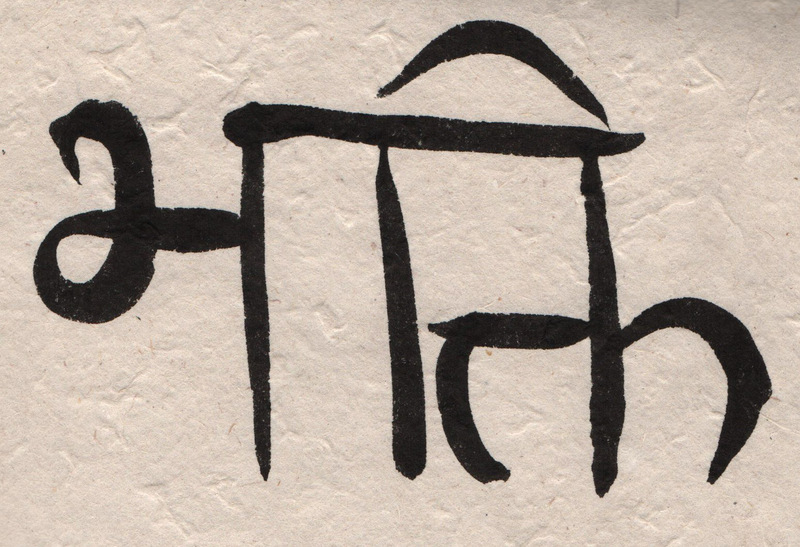 I have begun to apply the method to Sanskrit calligraphy. 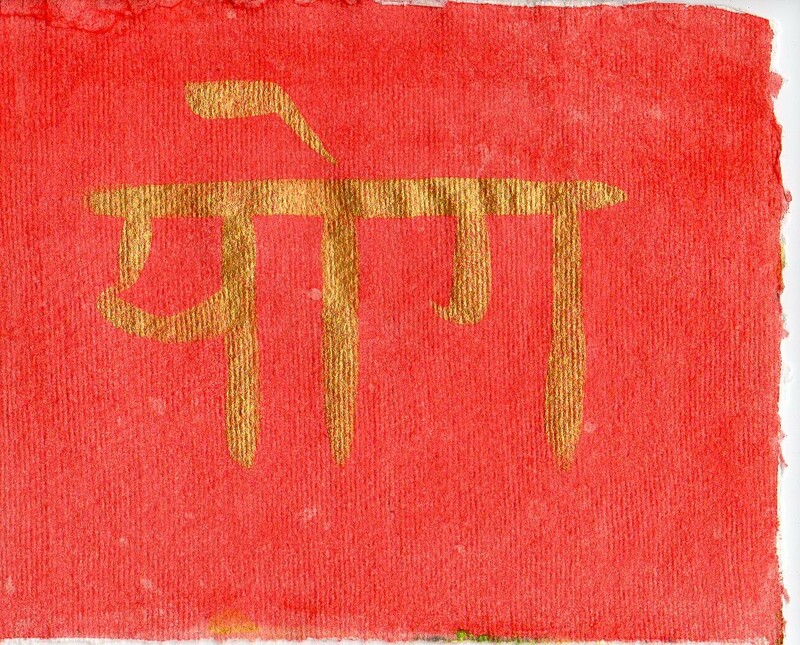 In Sanskrit, Ki is Shakti. Both words refer to the same energy that permiates the cosmos, and gives us life. It is everywhere and everything is made of it. 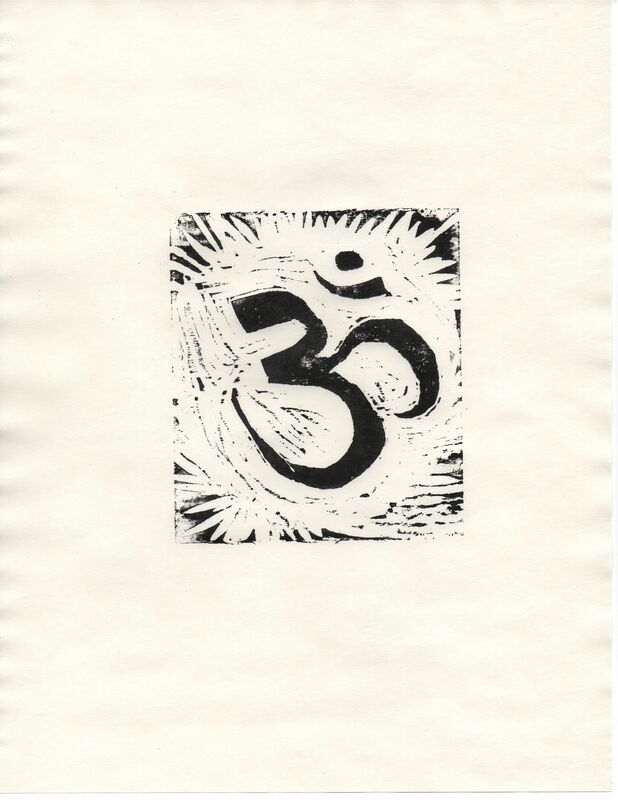 It creates, sustains and will ultimately dissolve the universe. In India, Shakti is worshiped as a goddess. The awakening of this energy and connecting with it is known as kundalini yoga. It’s 2016 and like many people, I have decided to use this landmark to focus my efforts personally and professionally. To this end, I have decided to concentrate more on meditation and trusting in God this year. Professionally, this translates into focusing more on sacred calligraphy. 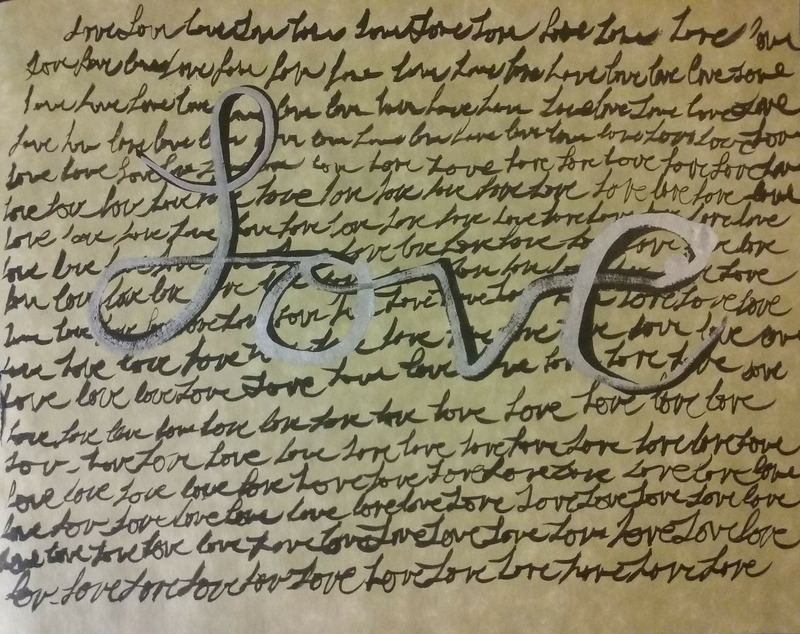 While I have been doing this for years, I feel that I reached a turning point last year, in making the calligraphy more of a personal expression. This has always been my goal, but at first, I was so worried about getting the letter forms correct, that what I was doing could be better described as hand lettering. My training for this is particularly unique. 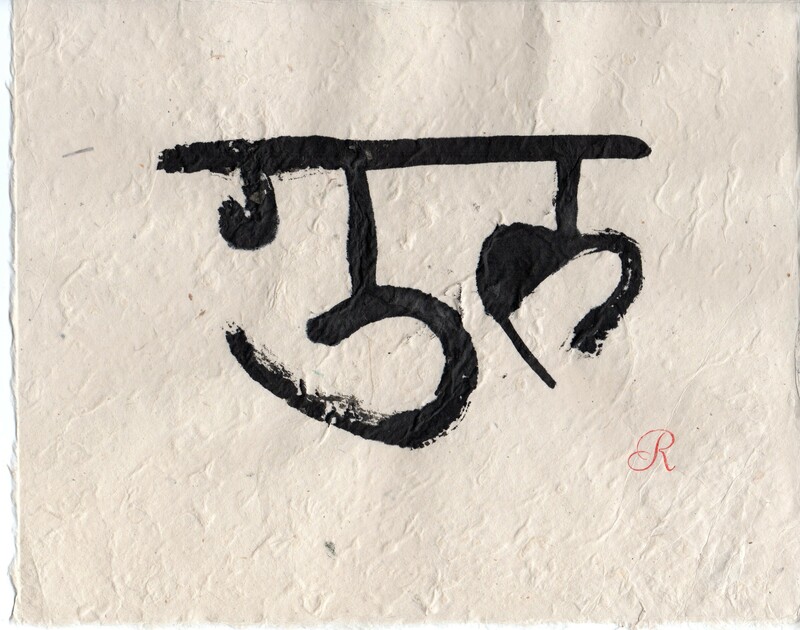 Many people study calligraphy, many people study typography, and many people study sacred languages. (Actually, in all three cases, many is a relative term; these are rather specialized fields of study) While there is no doubt some crossover in these three areas, the Venn diagram (imaginary in this case, as I am too lazy to actually research the numbers to make my point) is smallest in area where all three fields of study converge. 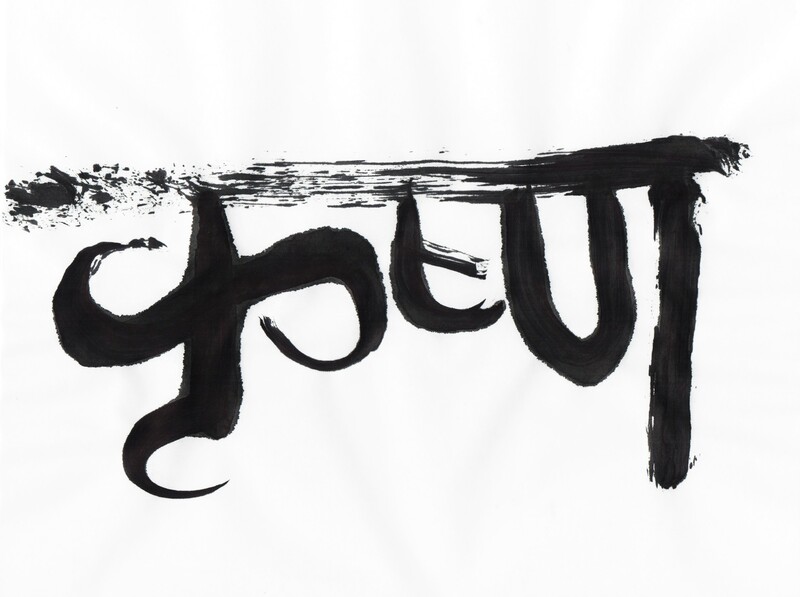 In this blog, I will talk in detail about the meditative quality of various methods of sacred calligraphy, the difference between how I approach different styles and different languages, as well as what makes for a good word or phrase. People have been doing this for thousands of years in every culture known, so there’s lots of room to study past masters. Be sure and let me know what your interested in, and if you do sacred calligraphy what your approaches are. 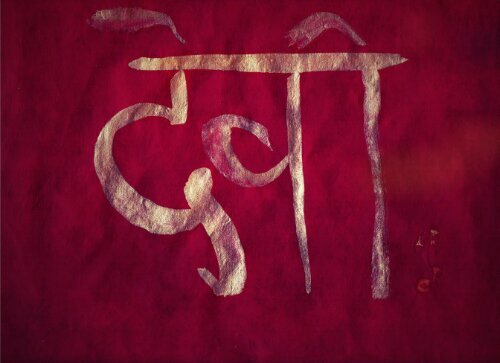 I focus mostly on Sanskrit for my calligraphy. I’m basically learning Sanskrit one sacred word at a time. Sanskrit was developed specifically to record the Vedas, the sacred scriptures of India. There is also Tibetan Sanskrit, which is related, but not the same as the Vedic Sanskrit I focus on. The letterforms of the language are known collectively as Devanagari. There are plenty of Sanskrit scholars who know more than me and Vedic scholars as well. I do not claim to be the foremost authority on these subjects. I do not claim to be the best calligrapher in the world. I think you will find my approach fairly unique, although I don’t think I’m the only one in the world doing what I’m doing. I also am learning Zen calligraphy, which I freely adapt to the various languages as a style while also learning the more straight forward methods of kanji calligraphy. 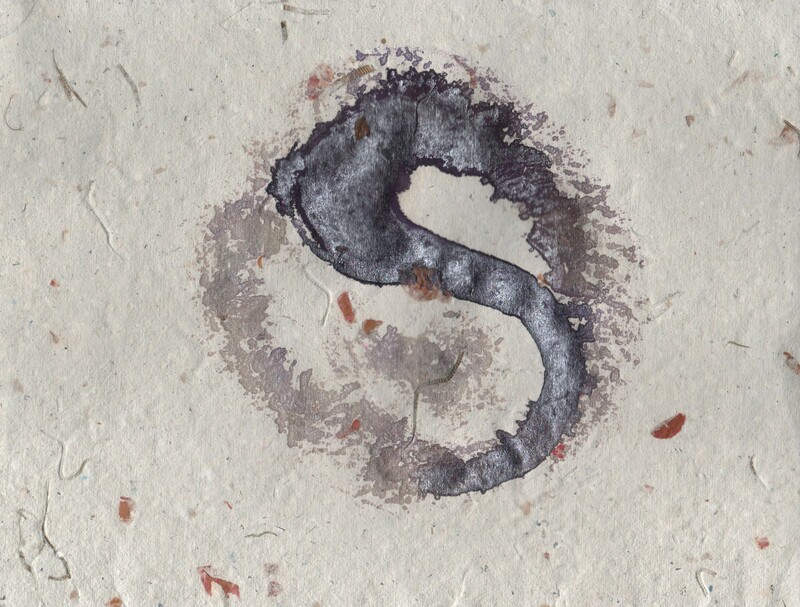 I have also done Hebrew calligraphy. I have done all of these professionally, and am going to expand my repertoire this year. Perhaps I will learn Tibetan Sanskrit and maybe some Arabic. I can only promise it will be an adventure.